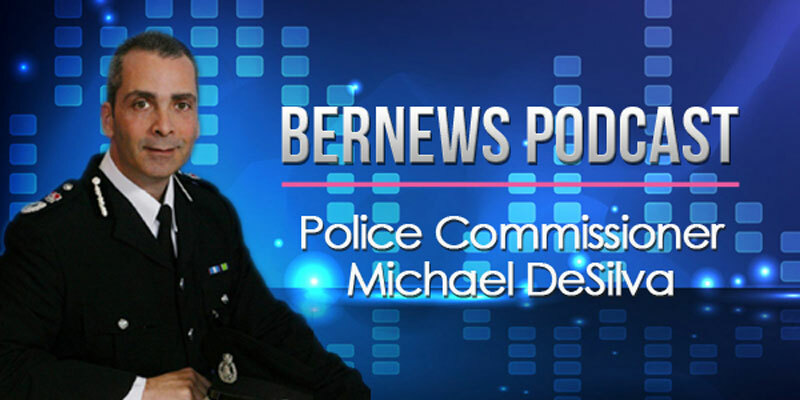 The latest episode of the Bernews podcast features an interview with Commissioner of Police Michael DeSilva, covering topics including the police budget, road safety, reports by the Auditor General, the investigation into the ‘Jetgate’ affair and more. Commissioner DeSilva touches on the parts of reports by the Auditor General that overlap with ongoing police investigations and the ongoing investigation into the ‘Jetgate’ affair, with police following lines of investigation in both Bermuda and the United States. Also discussed was the police advising Government that roadside breath testing should be done on a random basis and that the issue now sits with the Department of Transport. He said that as of April 1 this year, the Service had still to find savings of $4.5 million and by May or June, there was only nine months’ worth of salary, so the decision was taken then to release some officers from their contracts. Last month, another seven officers were told their contracts would not be renewed; those officers are now considering legal action. Commissioner DeSilva also said they have 12 Bermudian cadets with a three-year commitment to work for the BPS. “I have 12 young Bermudians that are expecting a job and that is extra payroll unless I make extra space for them. So that complicates it as well,” he added. He also said it might be a case of transferring some work to other Government departments. On the so-called Jetgate affair, the Commissioner said, “There have not been any arrests, no-one has been charged and we are still very much in the process of assessing all of the material which is in the form of a combination of witness statements, bank statements and other documents and emails. Bernews’ podcasts aim to provide an in-depth look at current affairs, and the text extracts above represent only a small portion of the full interviews. You can also download the episode in MP3 format here, view past podcasts here, and subscribe via iTunes to download all our podcasts directly to your phone or tablet. Did he address the fact his staff are off the job and are at Cabinet complaining about having to face real life? Having to face real life ?! More like not wanting to loose $1000 plus dollars per month from their salary . Do you have that to loose ? Everyone else already contributes to their own healthcare. And those who have lost their jobs in the private sector matter not to you Mr. or Mrs. Police ??? They have lost way more than 1k a month you dreamer !!! The rest of us already have lost that many times over. « Independent Directors – Do They Bring Value?